This entry was posted in 2013 Books, 2014 Challenges, Ancient World, Author: Plato, Author: Socrates (character), Classics, Classics Club, Great Books of the WW, Greece, history, Review, The Pre-Printing Press Challenge by cleopatra. Bookmark the permalink. Interesting post! I am trying to introduce myself to ancient literature and am a bit at a loss where to start. 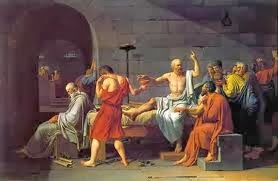 I know that many philosophers based their works on those of their teachers (like in case with Plato), so it would make sense to begin at the roots. If I start with Socrates, do you think I'll be okay? I chose to start with the Greeks and, first of all, I bought a book that would quickly introduce me to its important figures and its history. The Book of the Ancient Greeks by Dorothy Mills is excellent. It is aimed at high school students but it gives great background and it is not too overwhelming. Then I started with The Iliad, which I would recommend. Everything in Greek literature refers back to the war with Troy and its heroes; apparently Greek children were required to memorize the whole thing! 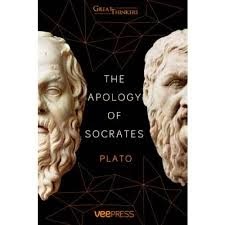 Even in The Apology, Socrates mentions Troy so this is probably the best place to start. I would also read it in smaller sections so you can mull over what you've read. I scheduled it over about 2 months, reading regularly, and found this very helpful. It cemented what I'd read and made the book not so overwhelming. The Teaching Company (Great Courses) also has a great course you can purchase on The Iliad if you need further help. If you are looking to work chronologically through the ancients, The Bible and the Epic of Gilgamesh would pre-date The Iliad (and possibly some other works that I'm not familiar with) but personally I liked The Iliad as the starting point and then you can move to The Odyssey. I admit I'm very picky about translation, but I would highly recommend Richard Lattimore for The Iliad. It's an excellent translation and IMO, clearer, more enjoyable and he communicates Greek culture very well. For The Odyssey I made the mistake of first reading Lattimore's translation (because I liked him so much for The Iliad) but Fagles was much better. Wow so much useful info, thanks! I can't believe I've never heard of Great Courses. I checked out my library and they actually stock a huge collection of their DVDs. I already put the Iliad one on hold. Thank you so very much for opening my eyes! I will take your advice and read The Book of Ancient Greeks first to get some background information. I also tried to read The Iliad before, but put it aside, so hopefully this ancient lit project of mine supplemented by the educational videos will motivate me to continue. Homer is definitely on my list of authors to read. I have both Iliad and Odyssey in Fagles translation, but I will search for a copy in Lattimore's to compare. Again, thank you kindly for sharing your experience. I can now take a few first firm steps on my journey to ancient literature. You're so welcome! Let me know if you want to do an Iliad buddy-read if you are going to read it later in the year. I've been wanted to re-read for the past year or so. I'm pretty "booked" up (ha, ha!) until April but after that my schedule opens up a little. Will do! That would be very nice!